Chiropractic care can allow moms to have the safest, most natural birth experience possible. 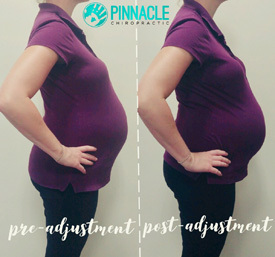 Pregnancy chiropractic at Pinnacle Chiropractic allows a mom’s pelvis to be properly aligned and nervous system to be functioning as it should so that her baby can grow and develop optimally. We want you to feel empowered to have the labor and delivery that you want, with gentle chiropractic care appropriate for each trimester of your pregnancy. Our low-force methods include the Webster Technique, which aligns the pelvis while concentrating on ligaments, tendons and soft tissues so that your baby can be in the right position for delivery. Specialized tables ensure that no matter what month you’re in, you’ll be comfortable during your care. We encourage you to begin chiropractic care before conception or as soon as you discover that you’re pregnant. If you wait until you feel pain, you may require more care at the start. Many women who have had fertility difficulties have been able to conceive after receiving chiropractic care. You’ll feel right at home in our warm, welcoming atmosphere. Moms tell us that they look forward to their visits at our office. Contact us today to get started! We offer complimentary consultations so that you can find out more.